"Stackable Rings, Infinite Love Stack"
Little stacking rings for when your love is infinite! 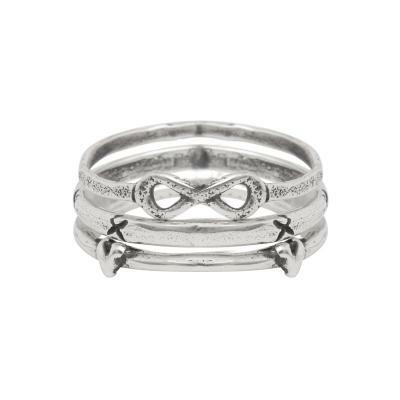 This sweet little stack is a collection of kisses, hearts, and a infinity symbol. The Infinite Love Stack puts it all together. The infinity symbol, a band with tiny kisses and another with precious hearts. All three together shows your love. This set makes a great gift for the one you love or a pick-me-up gift for a friend. Show someone how much you care. This is a set of three individual rings stacked together. Available in sizes 6, 7 and 8. When determining your size, we ask that you give us a size that fits comfortably. The rings are available in whole sizes 6, 7, and 8. If you are unsure of your size, you can purchase a ring and select ring sizer from the drop down menu. We will send you a ring sizer and instructions on how to email us your size. If you are between sizes you need to decide if you want the ring(s) to fit a little snug or loose.